It's been just over a year since I joined the international polyglot community, and you've probably heard me say or read from me that it's rather been a gamechanger for me. Here's another gamechanger: I'll be attending my first LangFest Montréal this year! Not only that, but I've been fortunate enough to be given a platform to speak about one of my favourite topics. Thanks LangFest! In my talk Moving Beyond the Middle: How to get out of the Intermediate desert, I'll be talking about language learning's most underserved and least understood group of learners: Intermediates. 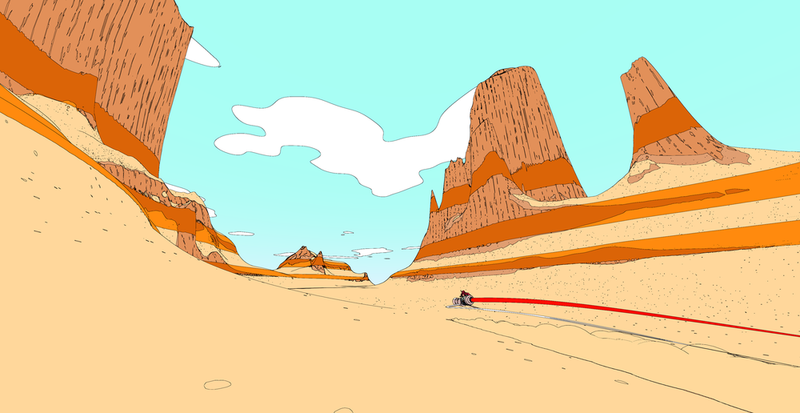 Image from the excellent Moebius-esque video game, Sable, courtesy of Shed Works Games. Clickthrough to learn more and support an indie game! "What is an intermediate, really?" In my talk we'll walk through some myths and some truths about what it really means to be an intermediate language learner. We'll laugh, we might cry, but most of all, we'll relate — because we've all been there, and as polyglots we'll continue to be there as long as we take up new languages. Being an intermediate learner isn't one-size-fits all; it's deeply dynamic, and it changes as you learn more language and make more connections. We'll look at some ideas and perspectives about what it really means to be an intermediate language learner. "I've been wandering around in the intermediate desert for forever, now what?" Time for some motivational therapy is what. OK, I'm not a therapist, but I've been a language teacher for 17 years and if there's one thing I've learned from my training and time in the classroom, it's that learning another language is full of psychological struggles with our perceptions and misconceptions about ourselves, our capabilities, how the learning process should be, and what we ought to be achieving and when. We'll look at some of the emotional and practical linguistic barriers that intermediates encounter, and what to do about them. There are no clear answers because each learner is unique, but my aim is to give you some inspiration to come up with your own actionable plan for getting yourself out of the intermediate desert, or at least onto a fertile oasis of progress. Learning French for LangFest and feeling the intermediate desert heat? Hear my not-even-intermediate Estonian for the LangFest Language Défi! Got something you'd like to see or hear about in my talk?